Glutard foodie and adventure seeker. Where do you go when you want cheap, tasty, fast Asian food? Naturally, I head towards Gouger St, but when there I get stuck. Do I go to BBQ City? Not the cheapest, not the best, but open to all hours so it's the perfect place for after-sporting hunger. Branching further afield, I come across Noodle Kingdom, which has a dark, cool interior and an intriguing front tank with varieties of animal floating around. For $9.80 I try traditional beef noodle soup with handmade noodles. Disappointed by the amount of coriander in comparison to the menu photo, it was nonetheless delightfully fresh, with simple Asian flavours. From previous visits, I recall their bowl sizes to be very generous, and am pleased again. All their dishes come in wide and deep bowls. The result is a filling, fresh and enjoyable experience. A waitress even gives me a free chopsticks lesson, dramatically improving my technique in mere moments. I am now able to eat noodles with chopsticks for the first time. Normally I have to give up and shamefacedly ask for a fork. The other contender in the Cheapest category is Noodle Dumpling, just down the street from Noodle Kingdom. Definitely the cheapest along the street, their food lacks the freshness of their competitor, and instead has an artificial flavour. You don't feel like you're having a wholesome meal, and the colour of the food is washed out to a creamy grey colour. The dish sizes are average, and overall, not worth the saving of one or two dollars. My personal favourite however is Evergreen, hiding near the corner of Gouger and Moonta Street. Its general menu is more pricey for meats and special dishes, however each night there are two dishes on special, often as cheap as $7, and always the favourites. Friday night is my Evergreen salt and pepper crab night, which I religiously attend. 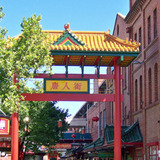 Between these options, you will be set to find something tasty and cheap whenever you head the Gouger St way. Enjoy! Between 3 and 4, Monday to Friday I like to go to the food court nearest to Grote street chinatown entrance and get the end of the day all you can eat for $5, There are 2 chinese places to choose from. Ha, I had that for lunch/afternoon tea yesterday! It was a little cold and nasty, but not too bad. Maybe I should do an article on the food courts, though I prefer the restaurants. For good ol' tasty and very fresh Chinese takeaway in the 'burbs, cant go past August Moon Chinese TakeAway in Glenelg East. An institution to all the locals for over 30yrs - must be doing something right! Its always a toss up between their honey or lemon chicken...to die for!!! Try their spare ribs too! Mmm sounds good, will definitely try it out!